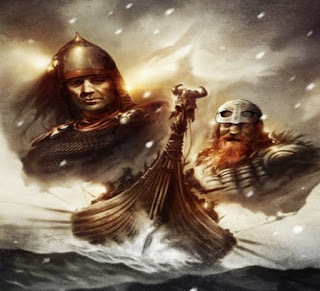 "Irish Pirate meets Danish Viking"
Cormac Mac Art (nicknamed an Cluiun - "The Wolf") was one of the Irish Reivers - bold pirates who range far among the ruins of the Roman Empire, reaching Spain and on occasion even Egypt. Cormac Mac Art became outlawed and had to leave Ireland in a hurry, and he found refuge and a new home among the Danish Viking band led by Wulfhere the Skull-splitter. He became Wulfhere's right hand man, the two of them complementing each other and working harmoniously together. Wulfhere is a bellicose and formidable fighter. Cormac Mac Art, is a formidable swordsman, and is also well-informed on the affairs of the numerous kingdoms, tribes and factions of the British Islands and beyond. Cormac has many enemies, Irish as well as Scandinavian - but he manages to elude them, again and again. Together Wulfhere and Cormac go through many dangerous adventures.